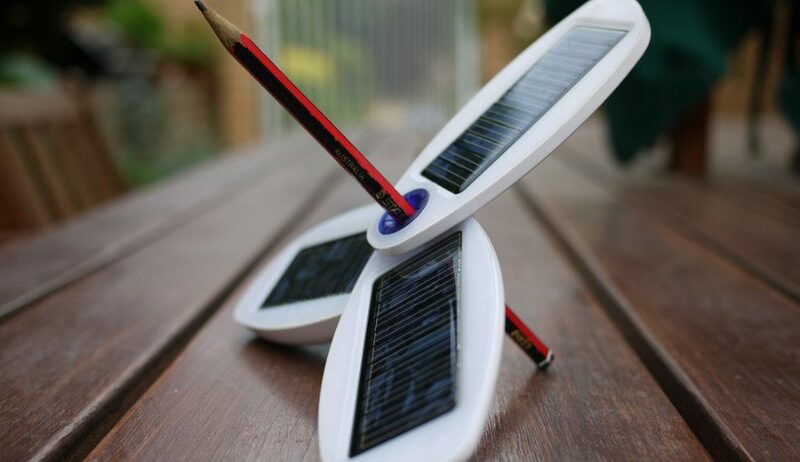 If you’re looking for a way to support innovations in solar technology and get your hands on the very latest in trendsetting solar gadgets, Kickstarter is a great place to start. Depending on how much you’re willing to invest, there are sometimes some great perks to supporting solar gadgets at the ground level, including being one of the very first people in the world to show off a new technology. The projects looking for funding change all the time, because campaigns last between 30 and 60 days. This month, we found three solar gadgets on Kickstarter that we thought were worth a closer look. Make the sun work for you on the beach. 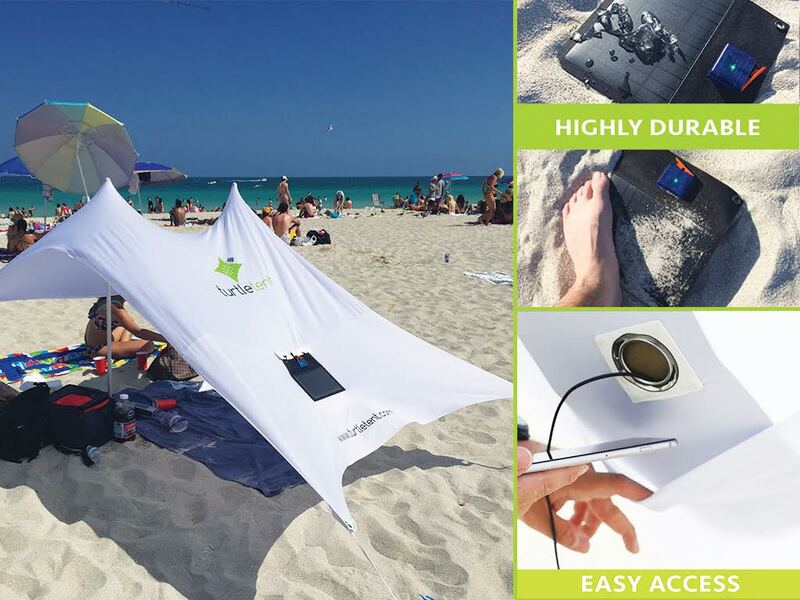 Turtle Tent is a lightweight shade canopy with an integrated 5.5W solar panel that can keep your phone or small electronics charged while you’re lounging on the sand. Don’t worry about your electronics baking in the sun: the two USB charging ports are accessible from the inside so your devices can charge in the shade beside you. The panel generates enough energy to power a bluetooth speaker, and Turtle Tent’s designers say that an average phone can reach a full charge in about an hour on a sunny day. The tent provides shade for up to 4 people and is super lightweight at only five pounds. The tent material is a stretchy Lycra blend that blocks 98% of UV rays (UPF 50+ rating) and the support poles can be repositioned easily over the course of the day to change the tent’s shape and provide better shade as the sun moves. There’s an additional eco-friendly bonus for the green-minded consumer who buys into the Kickstarter campaign: they support the seeturtles.org billion baby turtle program which guarantees 2-4 baby turtles will be saved per tent sold. Backing the project with $88 worth of enthusiasm will get you your own basic Turtle Tent, but there is a battery upgrade available if you’re willing to spend $20 more. 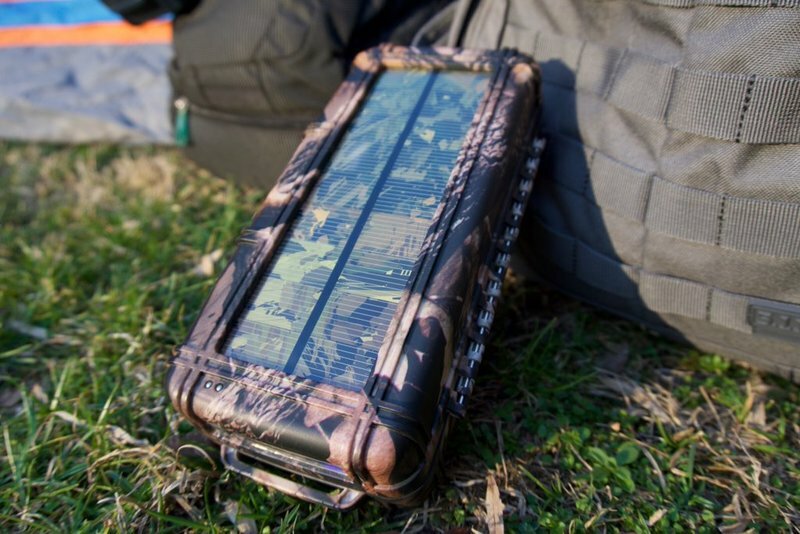 There are dozens of portable solar chargers on the market, but RokPak delivers something different for people who spend a lot of time outdoors. Their charger is built into a secure water-tight box, and it’s undergone serious durability testing to prove it can withstand a ton of abuse. The RokPak is drop-proof, dust-proof, and works at temperatures from -20C to 80C (-4F to 176F). It has a padded lining inside to keep your valuable electronics safe. It floats, and has a water-activated flashing LED SOS beacon in case you flip your kayak and need rescuing. The beacon doubles as an LED flashlight with 4 different settings. The embedded solar panel charges a 12,000-mAh lithium ion battery that has a built-in protection circuit module to prevent overcharging. Once the battery has some stored power to work with, you can charge two devices at once via two USB ports on the RokPak’s interior wall. A small LED on the interior surface makes it easier to find those USB ports at night. And if you’re worried about missing an important call or text while your phone is safely charging in a sealed RokPak, they have that covered too: the LED beacon flashes at you when your phone needs attention. You’ll have to cough up $159 or more (that’s the early bird deal, and it’s almost gone) on Kickstarter to get your hands on a RokPak, but if you’re big on camping or climbing, this might be worth investigating. The product seems like a good bet for anyone whose hobbies take them up cliffs or down rivers, far from the beaten path. Lifepack‘s solar-powered product is a solution for the less outdoorsy among us to charge our gadgets on the go. It’s a modern and fashionable backpack marketed towards the busy city dweller who’s trying to “navigate the urban jungle” and balance a business life with a little fun. They’re calling it a “mobile office” with two compartments: the “lifezone” and the “workzone,” built into a weatherproof lightweight bag. The Lifepack has features very attractive to anyone who takes their work on the road, like journalists, writers, or entrepreneurs. Its high-capacity battery stores enough energy to recharge an iPhone 12 times over, and a solar panel built into the backpack’s design ensures that there will always be enough energy available to keep your phone or tablet from dying in the middle of something important. 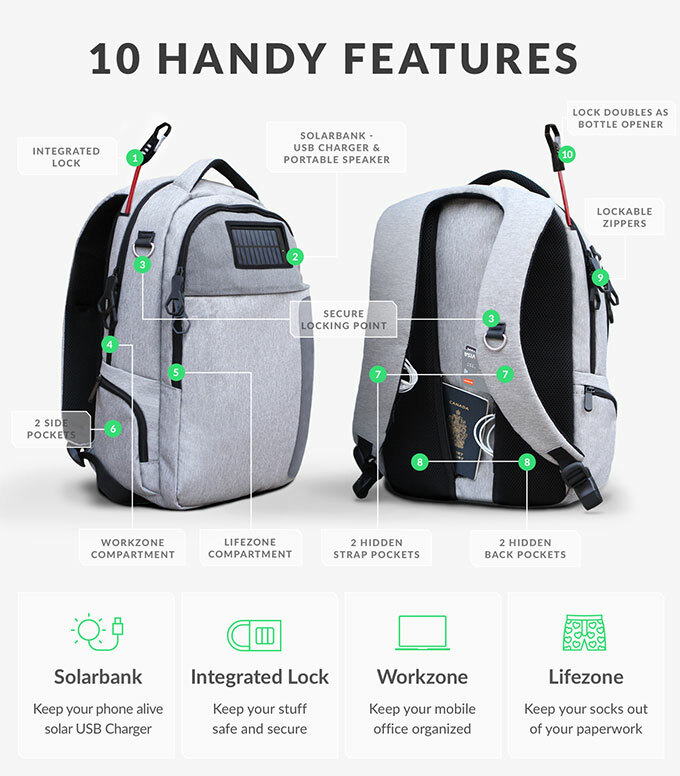 The backpack is weather resistant, contains padded air-filled compartments to protect your laptop from drops and bumps, and it has a built-in anti-theft tether. The quarter-inch stainless steel cable with integrated lock can be threaded through the zipper to keep the bag from being opened, and can also be tied around a secure object like a bike rack or heavy furniture so that you can safely leave the bag unattended for short periods at the coffee shop. Buying into the project at the $159 level will get you your own Lifepack, but there’s a special $129 discounted rate for students who can provide a valid school ID. What if the projects I backed don’t get their funding? Not every product on Kickstarter connects with enough investors to raise the money they need. Projects only move forward and collect their pledges if they’re 100% funded, so you get your pledge money back if they can’t hit their target. Not all is lost, however: the products’ websites often have mailing lists so you can stay plugged into the concept and buy in when they give fundraising another try. Some products are even available for sale on the manufacturer’s websites. So if you’re coming to this article after these gadgets have already finished their Kickstarter campaigns, check out their websites! Investing in solar tech is the best way to encourage innovation.